The Mousmé (Shaftesbury, 9 September 1911) was the successor to The Arcadians. It went back to the Orient that had served so well in Sullivan’s The Mikado as well as in Sidney Jones’s The Geisha and San Toy. It also looked forward to the shows of Ivor Novello in featuring a spectacular earthquake. 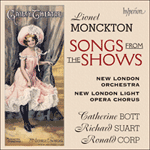 The sublime waltz The Temple Bell was sung by Florence Smithson, a coloratura soprano, and it necessitated Monckton writing for a voice very different from those available to him at the Gaiety.